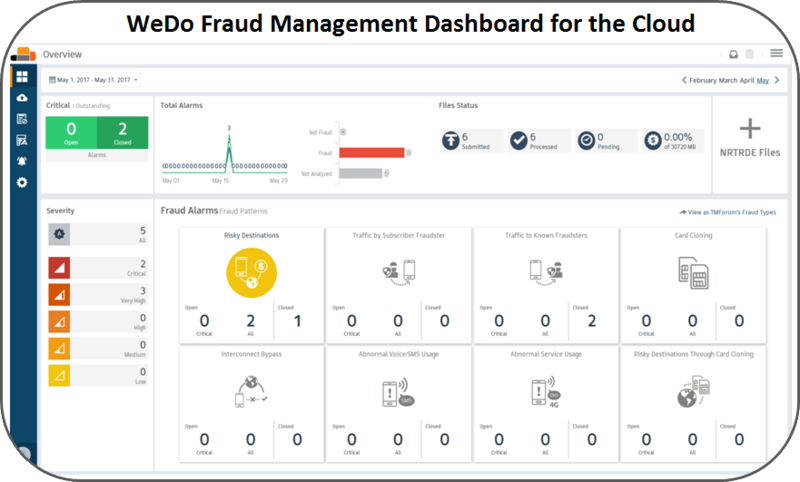 WeDo offer fraud detection in cloud. Fraud management systems (FMSs) that detect and help block premium rate or International Revenue Share Fraud (IRSF) have been around a long time. And as you can well imagine, FMS solution providers are racing to bring to market new capabilities that offer them an advantage over their rivals. Certainly one of the key areas of differentiation is cloud support. How quickly well-established fraud departments will move to cloud solutions is not known, but in the near term, the low end of the telecom market will probably find FMS-in-the-cloud attractive. Cloud deployments fit the low cost, easy-to-deploy-learn-and-support requirement of a lot of new operators, OTTs, and MVNOs. One FMS supplier who is flying with confidence into the cloud is WeDo Technologies. WeDo Technologies is the leading provider for revenue assurance (RA) software, and is committed to bringing its RAID platform into the cloud across its RA, analytics, and FMS lines. Indeed, one of the key reasons WeDo Technologies acquired Washington DC based Connectiv Solutions a few years back was Connectiv’s operations and experience to deliver cloud solutions in the US. WeDo Technologies has launched one of its first RAID cloud products — a solution for roaming fraud, and here to talk about that initiative is Thomas Steagall, WeDo Technologies’ VP for North America. Dan Baker, Editor, Black Swan: Thomas, it’s exciting to hear WeDo Technologies is now supporting cloud-based FMS solutions. I’m curious, why was roaming fraud the first fraud section you brought into the cloud? Thomas Steagall: Dan, detecting roaming fraud at its essence is done by analyzing data that is already exchanged outside between operators making it easy for CSPs to load information in your cloud system and taste a bit of what they can achieve by using our platform with other Fraud Apps. On top of that, if you look at the CFCA reports, Roaming Fraud is one of the biggest concerns for CSPs. The roaming fraud solution is now up and running in the North American data center and has started to be delivered worldwide. How much integration is required to have it up and running? Really Dan, the only integration required is the setup to automatically load (via FTP) the client files on-line. As soon as new data files are available, they are pulled into the cloud where the analysis is done. At that time, all the fraud patterns are detected and it says which ones are critical and then you can drill down to see subscriber details and all the information available in any one specific case. Now on the mitigation side, because we don’ t have direct access to the telecom operator’s line of business applications, we simply inform the user on what to do to close a fraud case. What’s the user interface like? Well, we’ve picked our on-premise interface that is very well accepted in the market. We’ve enhanced and tweaked it a bit to adapt it specifically to fit cloud requirements such as data loading interfaces. In fact, they are both built on a web interface. The main dashboard on the app is where you can directly access all the alarms. You also have access to all the information already uploaded — with all the files analyzed. The cloud solution has a set of risk management Apps from where I would like to mention one in particular called Digital Footprint. This App collects public information on the web to generate detailed profiles of potentially fraudulent subscribers. We are putting machine learning information on top of collected information. We can already provide CSPs in North America information they can use to deliver potentially risky profiles or enrich their current fraud systems. Our solution also provides the APIs to those who just want to get the intelligence feed. Also, there’s a Test Event Generator included, a distributed test platform based on crowd-sourcing for mobile operators that monitors RA, fraud, and network performance issues and analyzes the data by region or device type. What are the major differences between this cloud product and WeDo’s on-premises deliveries / solutions? At this stage we have two main differences: 1) the technology itself due to cloud constraints and 2) advantages of running it on the cloud. If you ask me, one major difference is how easy it is to setup the cloud solution. As soon as the CSP gets access, he can, within minutes, use it and produce results immediately. In fact we are so confident of its success, we are currently running a 60-Day Free Trial campaign. There is no upfront investment for CSPs: the product is leased and paid on a monthly basis. Moreover, the subscription fee is based on the list of Fraud detection Apps acquired. In other words, you can build up your own FMS progressively. You don’t need to start with a full stack solutions’ system. One of the biggest attractions is that your technical department doesn’t need to worry about servers and upgrades. By subscribing to the cloud fraud solution, you’ll get free updates, free data backups — and everything is included in the fee. What functionality is sacrificed in the cloud version? Well, in the near term, we have simplified the product. For example, WeDo supplies the rules you can use. Now the cloud user can set the thresholds at which the rules kick in — to block fraud, send alerts, etc. But if you want to create new rules for fraud types currently not included, then you need to get all the flexibility that the on-premises solution delivers. Similarly, in the cloud version we supply a global hot list of revenue share numbers to block, but our traditional on-premises solution gives you the added flexibility of adding your own hot list numbers to that global data set. Now one of the key advantages of a cloud FMS is that as new fraud schemes or behaviors are discovered, that becomes instantly available for all cloud platform customers. Basically, WeDo captures these patterns of behavior anonymously so everyone can benefit from the new pattern discovery. In 5 years, what do you think: will every operator want a cloud-based fraud solution? Well I certainly think the trend will be very strong because it’s becoming increasingly expensive — by comparison — to keep on-premises fraud management systems up to date. And internally at WeDo Technologies, our engineering team is adapting all our on-premise solutions expertise for the cloud. We already have a single software development framework. We now have a platform for fraud detection and specific roadmap points for on-prem and cloud platforms. We see the two things complementary and we will keep investing in both of them. Geographically, what’s your cloud roll out look like? Dan, the cloud solution is first being offered to the North American market but we have plans to expand it globally by the end of the year. One of the availability drivers is the data center hosting. Because we already have a data center working in the US, it’s convenient to offer it there firsthand. Privacy laws vary around the world. To sell our FMS cloud solutions in Europe we’ll certainly have to put it in a European data center in Europe. Well it sounds like a good plan. If someone wants more detail on this cloud platform, what should they do? Dan, as I said, we are offering a 60-Day Free Trial of the platform. Now we are qualifying those eligible to receive this trial: for instance, it’s only available to telecom providers. But our ability to offer such a trial suggests how easy it really is to setup and get up and running. The trial contains the full application — all the functionality of the full cloud suite. Anyone who wants to freely test it can do so on www.wedotechnologies.com/cloud. Thomas Steagall has more than 18 years experience leading high performing teams providing OSS/BSS consulting and system integration services to telecom operators across CALA, Europe and North America. In his role as VP/GM for North America and the Caribbean, he is charged with building on WeDo Technologies‘ accelerating momentum by acquiring new clients and supporting their growth strategies.